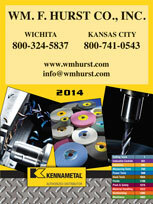 If you need metalworking fluids for your industrial operation in Kansas City, Wichita, Dallas, Fort Worth, or another nearby city in the Midwest, turn to the industrial supplies experts at Wm. F. Hurst Co., LLC. We’ve been in business for 50 years, and we have an excellent selection of coolants from renowned manufacturers, including industry leader Cimcool. CIMSTAR semi-synthetics – These metalworking fluids are ideal for general purpose and medium- to heavy-duty machining operations, and they are particularly popular in applications that require long fluid life and cleanliness. CIMPERIAL soluble oils – These machine-friendly fluids are designed for heavy-duty grinding and machining on both ferrous and non-ferrous metals, and many of these oils contain extreme pressure additives that provide for enhanced performance capabilities in the most difficult applications. In addition to machine coolants, we offer an extensive selection of other industrial supplies. Our comprehensive selection includes a wide assortment of assembly tools, including rivet tools, abrasives, power tools, and cutting tools for milling, turning, and hole making, such as carbide drills and end mills. Contact us today if you would like to purchase metalworking fluids or any other industrial supplies. Our highly knowledgeable associates are ready to answer questions you may have about any of our products. Wm. F. Hurst Co. proudly serves businesses in Kansas City, Wichita, Dallas, Fort Worth, Sedalia, Joplin, and many other cities throughout the Midwest.